Analyst brief brought to you by NSS Labs. 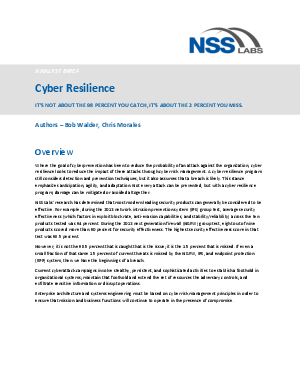 Where the goal of cyberprevention has been to reduce the probability of an attack against the organization, cyber resilience looks to reduce the impact of these attacks through cyber risk management. A cyber resilience program still considers detection and prevention techniques, but it also assumes that a breach is likely. This stance emphasizes anticipation, agility, and adaptation. Not every attack can be prevented, but with a cyber resilience program, damage can be mitigated or avoided altogether.